Many congratulations to Ysgol Treffynnon Year 9 student, Lucy Young, who recently travelled to Palermo, Sciliy to compete in the W.U.M.A. Karate World Championships. 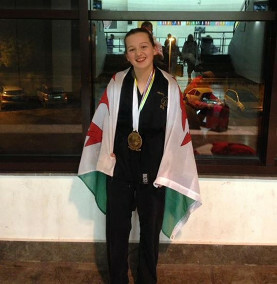 Lucy was chosen to represent Great Britain competing in team Kato and performed Basadai against four other countries. The team along with Lucy were placed 3rd and each member received a bronze medal. Lucy is currently 1st Dan, which is 1st Black Belt and is now training for her 2nd Dan which she hopes to achieve in 2018. Lucy’s aim is to take this further and hopefully compete in the 2017 World Championships which will be held in Poland. Lucy said “I really enjoy competing as a member of a team, it’s a great experience with everyone supporting one another”. We are extremely proud of Lucy and her achievements.